While Mike Pence decided to recognize Black History Month by honoring a white man, Donald Trump was busy vaguely listing the few black people he’s heard of throughout his 70-plus years of ignorant life in a zero-hearted attempt to care about anyone other than himself. The Twitter account has since been removed — which one user referred to as a “high-tech lynching” — but the alleged tweets are below. 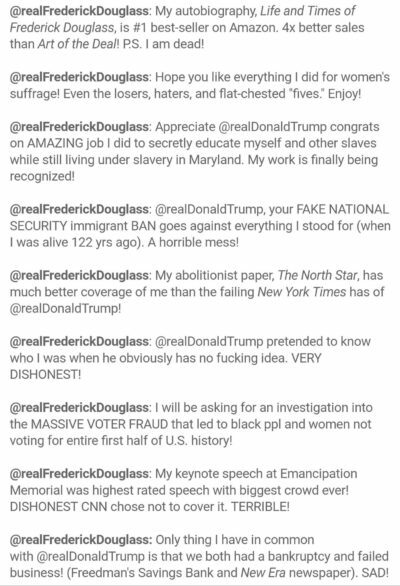 The spirit of Douglass is being kept alive on Twitter by the hashtag #realfrederickdouglass. US Uncut contacted Twitter to ask why the satire account was taken down so quickly, but have yet to hear back. Have you seen the Bowling Green Massacre fundraiser? Goes to ACLU! neat! Age of Ignorance has officially arrived!